The Nerbas brothers like to have bales placed before October 1. Their setup includes 12 paddocks with central water. 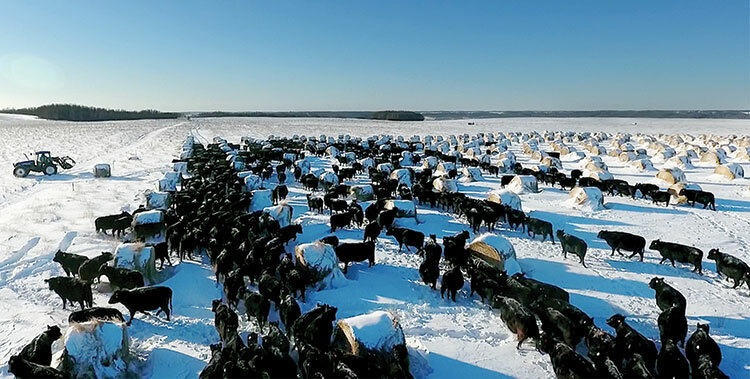 Grazing livestock in Northern regions where winters are long and harsh can prove challenging. For some producers, bale grazing has become a cost-effective, time-saving strategy to break past the pastoral barriers of these colder climates while also providing a way to improve pasture soil health in the process. For ranchers and brothers Shane and Aaron Nerbas of Nerbas Bros. Angus, this winter-grazing method has been rewarding. “Bale grazing for us has been a huge benefit for the land,” Shane Nerbas said. Waste from hay that cattle leave behind and manure are deposited back onto the soil. This has an additive effect on lower quality pastures and puts nutrients back into the soil where they are most needed. “There are also many other positives like reduced competition between cattle when grazing, reduced labor, and a better quality of life for both our families and the animals,” Nerbas noted. The Nerbas brothers run approximately 600 head of cows and up to 300 yearlings on their cow-calf operation located in Canada’s historic Assiniboine River Valley near Shellmouth, Manitoba. Their bale-grazing season typically starts around December 1. The duo began bale grazing their cattle about 15 years ago. However, this long run of experience didn’t begin without some challenges. The brothers fixed their management issues by creating more paddocks and using cross-fencing. The setup includes 12 paddocks with a central watering system that connects all paddocks. Factors such as pasture health and productivity are important details Nerbas and his brother consider when deciding which paddocks will be used for bale grazing. Poorer pieces of ground, such as those with thinning forage, bare spots, or less productive yields, are given top priority and bales are placed early in the fall. “We like to have bales placed by October 1 before things freeze over,” said Nerbas. Each year, six different paddocks are chosen to bale graze. A 21-day supply of bales is set up in each paddock. The paddocks are constructed with wooden posts and single-strand, high-tensile wire. Every 21 days, cattle are moved to the next paddock. Nerbas noted a plus of this method is it eliminates the stress of setting up and taking down fence. “Many people assume that this is very wasteful, but the math doesn’t lie,” Nerbas said. “There are enough bales in a 21-day paddock that all animals will get 3 percent of their body weight per day. More often than not, we reach or exceed the 21 days. Also, any feed leftover is considered biological capital to us,” he added. For the last seven years, Nerbas pointed out, they have been setting up their bale grazing in pastures that also have stockpiled forage. Not every situation will be the same for everyone, but it’s vital in today’s cattle industry to keep your costs down however you can. Bale grazing can help do that. I have never met anyone who has tried it and went back to conventional winter hay feeding. Late in the bale grazing season when the weather gets milder, Nerbas explained cattle may be limit-fed bales. This is done mainly to allow for more efficient feed utilization. The freezing and thawing accompanied by warmer temperatures often leads to more waste and fouling of hay. Limiting the number of bales cattle graze at a time can reduce losses. In these situations, the brothers use a portable fencing cart known as the Power Grazer equipped with a mile of wire, a solar panel, and a Gallagher fence charger to fence off and limit the number of bales cattle can access. For those interested in giving bale grazing a try, Nerbas recommends first-time bale graziers start on a small scale. For example, set aside one to two fields for bale grazing the first year. Another detail experts suggest paying attention to is how the land reacts post-bale grazing. Declines in pasture quality can mean animals or bales are stocked too heavy. Additionally, keep fences hot; winter weather can put a drain on electric fences. Having a high-quality fence charger capable of maintaining 10,000 volts will help to keep this from becoming a problem. This article appeared in the February 2019 issue of Grower on pages 22 and 23.